In a bid to keep Shimla and its surroundings free from ecologically damaging activities, the Shimla High Court has come down heavily on stone quarry owners and stone crushers in and around the town. A court judgement on January 7, 1994 in effect preempts clearance from the Union ministry of environment and forests for a proposed environment protection zone for Shimla and its suburbs. 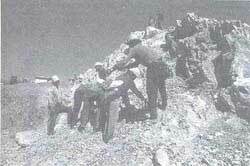 The quarry owners had become the target of an environmental crusade in 1992, when the acting chief justice of Shimla High Court, Bhawani Singh, chagrinned by reports on the environmental hazards of these quarries and crushers, dragged the quarry owners to court. In March 1993, the high court had given the quarries six months to find alternative sites. According to officials of the state geologist's office, "Acquisition of suitable sites has proved to be immensely difficult because most stone deposits identified fall in private land." The latest court judgement says all quarrying and crushing activities have to stop by January 25, 1994. Quarry owners and government officials are desperately hunting for alternative sites to rehabilitate the 15 quarries affected by the judgement.